A favorite of gardeners and gardeners – Lobelia – looks like a miniature geranium. The homeland of origin – South Africa. An annual herbaceous plant is undemanding and can grow in full sun or shade. Very delicate flower is ideal for decoration of balconies, flower beds, decorative pots or hanging pots. Lobelia (lobelia) belongs to the family campanulaceae. The plant prefers rocky and moist soil. The main advantage of Lobelia is that its small, pale blue or blue flowers are perfectly combined with other large and colorful plants, making a wonderful backdrop in any flower arrangement. That is why Lobelia is often made use of in landscape design. There are three kinds of Lobelia: Lobelia upright, basket and compact, where all the plants differ in height and shape of the Bush. Upright Lobelia reaches a height of not more than 30 cm, twigs basket plant grow in length up to 40 cm, but compact - does not grow above 15cm. Flower Lobelia small a diameter less than 3 cm, but due to the fact that blossoms are always a lot of flowering Bush looks magnificent and solemn. The happy gardeners plant flowers until the first frost and requires no special care. By the way, if you grow Lobelia on the balcony, then easily you can extend the flowering and in winter. To went new shoots and Lobelia again bloomed bare Bush must be pruned, fed and watered. The main thing here is to observe temperature and not particularly zealous with the watering. 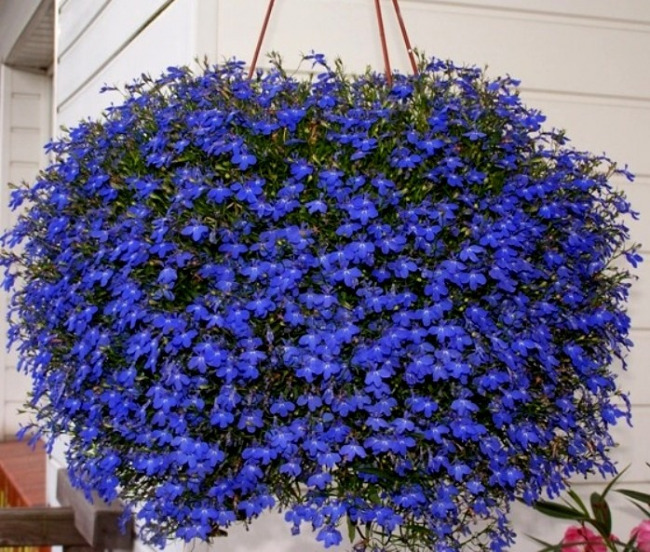 The fact that Lobelia not tolerate a strong excess moisture and direct sunlight. Having a good shade-tolerant properties, the plant is in bloom even in the North balcony. Thanks to the beautiful colors and the air mind, Lobelia has long occupied a worthy place in the hearts of gardeners and landscape designers. Don't have to grow Lobelia from seed. If you want to decorate the loggia of the decorative or draw the paths of the garden – you can buy a ready plant. But not everyone is a would-be grower will be interested to buy Lobelia as a commodity. Much more exciting to go through the whole process from planting seeds to first flowering. And we should not think that to grow a beautiful Lobelia is tricky. Undoubtedly, the work of the grower - it does not tolerate haste, but the result is worth it! The Lobelia flower is most often plain, but sometimes with a peephole. Depending on the variety, flowers may be white, pink, purple or dark blue. Lobelia, and Petunia propagated by seeds. To plant seeds in the soil of the plants is in late winter but can be planted in early March. Note that in this case, Lobelia develops slowly, so you wonder about the seedlings as soon as possible. But to sow the seeds in open ground until may. For seedlings it is best to use a shallow container. If you don't have a flower pot of the desired shape and height, feel free to use a plastic container from any sweets. Prepared container, fill in the decontaminated soil, and on top sprinkle a thin layer of calcined sand. As Lobelia seeds are very small, they are easy to plant in soil with a toothpick. On the tip of a wet toothpick to pick up a few seeds and then transfer to the wet ground. This planting method may not be suitable for all. So you can just evenly sprinkle the seeds in the planting pot. The top should not be covered with soil, as the seeds like to sprout in the light. If the container is put in a well lit place, first sprouts will appear after a few weeks. To speed up the process you can, if you cover the container with the seed film, thereby creating a greenhouse effect. The next stage is the cultivation of seedlings. Your seedlings will be beautiful and healthy if you will be able to provide her with proper care. To do this, carefully follow the soil moisture. Not worth it to lose focus and lighting. So the seedlings were strong, it should provide additional illumination on cloudy, rainy days and evenings. And plants need hardening, so it's good in March to take the seedlings outside. Alternatively, you can pass seedlings on the balcony, if it is located on the Sunny side. The grown seedlings should be thinned and seat. By the way, it is possible to dive even blooming Lobelia, but it is more troublesome and long process. The fact that unravel the long and thin stems fairly hard work, which not everyone will like. Seedlings of Lobelia can feed complex fertilizer. Additional forage can be produced one to two times before the start of the flowering period. Yet another method of propagation of flower cuttings. This requires to keep the Mature plant until the spring, filling it to the house. In the spring you should cut the stem and root them in soil. That Lobelia is better settled down, the cuttings can be dipped in the growth and cover with a plastic bottle, thereby creating a mini greenhouse. The greenhouse should be regularly aired and remove excess moisture from the walls. Water the cuttings should be only warm water. After the cutting is rooted, it can be given to the planting in the open ground. Sometimes outdoors on plants attacked by powdery mildew and other fungal diseases. If folk remedies do not help, feel free to use Topaz, otherwise the plant may be a long time to get sick and lose your lovely view. In a highly fertilized soil Lobelia are less likely to bloom, so it is not necessary often to feed. For a better branching seedlings of Lobelia, after a dive, you can repeatedly pinch back. It should be mentioned that Lobelia was named after the botanist de L Obelia, who lived in the 17th century. Today, Lobelia is a collection of hundreds of varieties: "Rosamond", "Crystal Palace", "Red cascade" and others. Even in the photo, the flowers of Lobelia are striking in their tenderness, charm and a nice clean color. That is why many gardeners like to decorate a garden that is beautiful Lobelia.